Yesterday Hannah experienced her first Royal Agricultural Winter Fair at Exhibition Place in downtown Toronto. As a child, I loved attending the fair - it really does bring the farm to city kids and teaches them why farms are important. Seeing the animals and winning crops, hearing and SMELLING the animals, you really do feel like you are visiting a farm for the day. We also got the opportunity to listen in as Grain Farmers of Ontario Resident Chef and Top Chef Finalist Jonathan Goodyear made Jalapeno Corn Bread. (That is, until Hannah started singing and then threw Wowbutter (a DELICIOUS soybean creation) at him...thankfully he is very down to Earth and kid friendly!) Chris stayed for the rest of the demo...we will definitely be having cornbread at our house sometime soon! 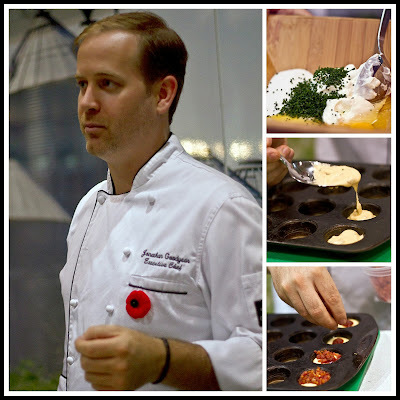 After meeting Chef Jonathan, we headed to The aMAZEing Food Journey which houses the Grain Farmers of Ontario Discovery Zone. We simply couldn't get Hannah out of the cornbox. 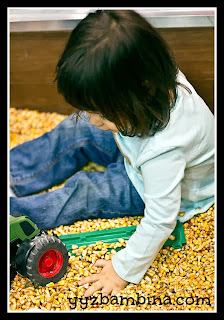 She loved touching the corn, playing with toy tractors in the corn, just being in the corn. It was a hit with all the toddlers attending the fair. You can check out these exhibits at the Royal until Sunday, November 10th. To find out when the Discovery Zone is coming to a fair near you, like the Grain Discovery Zone Facebook page. Grain Farmers of Ontario (GFO) represents Ontario’s 28,000 growers of corn, soybean and wheat. Their farmers' crops cover 5 million acres of farm land across the province, and are a major economic driver for Canada. Ontario-grown corn, soybean and wheat crops generate over $2.5 billion in farm gate receipts, result in over $9 billion in economic output, and are responsible for over 40,000 jobs in the province. 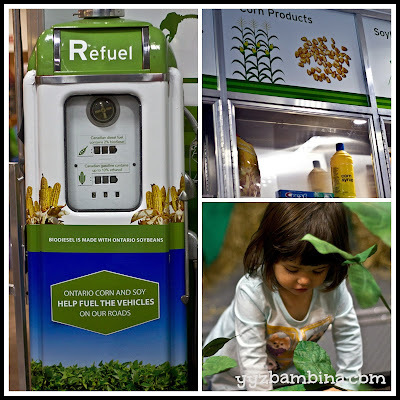 How do you teach your kids about agriculture? Disclosure: We received complimentary general admission to the Royal to review the Grain Farmers of Ontario exhibits. As always, all opinions are my own. What a cool looking event! I think it would be really interesting to learn more about where the food you're consuming comes from! It really is - and because a lot of the information is broken-down in kids terms, it's easy for adults to learn too while chasing their toddlers! Skwooshi is mess-free, creative fun!